Discover what's stopping you from reaching your income goals (and get the exact strategies you can use to make your online business thrive). There's a reason why you're not seeing any growth in your online business. It's because when you compare your business model to other models out there, yours is more likely to fail (or to never get started). chances are you're working from an unbalanced business model and you aren't implementing profitable strategies in your business. I developed my Strategy Mapping framework specifically for you. Because the business you've been dreaming about is possible. You know it is. You've watched other people just like you build businesses that earn enough to support their lifestyles and families. Businesses that give them the freedom to live the "good life". But, for some reason, that good life has always seemed impossible to reach. I'm here to tell you that you can own a business like that. One where you serve only the best clients by doing the work you love. And not a business that forces you to constantly hunt for new clients, compromise on your vision, or worry about whether you'll make enough to pay the bills this month. 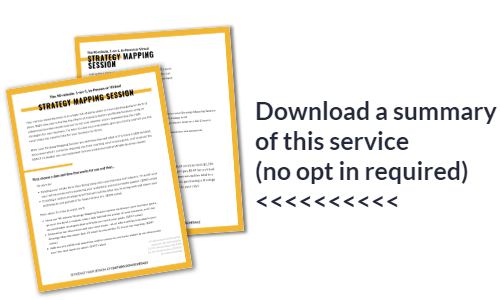 This 90-minute Strategy Mapping Session + Strategy Map + Follow-Up Support is your first major step to owning the business of your dreams. You'll want to bring pen and paper for this - it'll be so good! "My biggest obstacle was finding the right fit as a consultant. This person had to be open to hearing my struggles and fears without some canned response. I wanted a female consultant. A requirement was that I get “a feeling”, a bonding, from the start. Very hard to find these qualities until I met Christiana. Christiana articulated clear, concise steps to move forward. She confirmed that my business idea was a valid one, a question that has plagued me since the birth of the business idea. She presented ways to promote my business that I never would have thought of on my own. I enjoy the one-on-one encouraging environment she provides. Once you leave the consultation, you feel as though you can conquer the issues that worried you the most. Christiana continues to give ideas to propel you forward once you have implemented the last one she presented to you. She is always thinking ahead. She has an easy-going but confident personality; it therefore makes you feel confident after every meeting or phone call with her. She provides endless ideas that keep you moving in the right direction. I would recommend Christiana to anyone who feels apprehensive about starting their own business. I think I would still be floundering if I hadn’t met her. She will relate the strong points of your business and give you solid steps to cross the initial hurdles. I always leave feeling that I have found someone who is truly invested in the success of my business. When I feel stuck she pushes me beyond what I thought I could or ever wanted to do. You will be so motivated after consulting with Christiana. I am thankful every day to have found her; my progress with my business wouldn’t be where it is today without her guidance." "The only obstacle to booking Christiana was scheduling time. I went to see someone else and waited a few weeks to see her. I just took those weeks to be as ready as I possibly could be to have productive meeting. After meeting with Christiana I had more focus… she was able to help me monetize my business idea as quickly as possible. I also liked the examples she gave...and how she asked the right questions to draw out main points so that I’m able to present my offers in the best light. She is knowledgeable, friendly, and engaged in helping me to reach my goal. And this gives me energy to put in the necessary work...Christiana sparks the feeling of accountability and I am recommending my her to my son. Her knowledge and skill to assess the client’s need and then assist in executing a plan of success is awesome. Keep shining your light, Christiana!!! Sowing a seed in the lives of others means a glorious harvest is coming to you… be on the look out… it’s bigger than you can imagine…"
For the last 3+ years, I've combined my 10 years of knowledge to relentlessly research, test and implement Strategy Maps for my clients. And I would love to help you too. I created this formula for our strategy session to focus on helping you build your solid foundation for the business of your dreams. We’ll dig into the current status of your business, what your biggest business goals are, and how to bridge the gap between where you are now and where you want to be. The Strategy Mapping Session is the solution that you've been looking for. With my framework, I will show you all the hidden potential in your online business. This session will clarify (finally!) what you're doing well and what you can work on to make your business even better. I'll give you the EXACT steps you can take to build and scale your online business. If after implementing the strategies I recommend during your session you find that they haven't worked for your business, email me with details within 90 days of your session. And I'll double your investment by hopping back on the phone as soon as our schedules allow, going back over what we discussed in our previous meeting, and troubleshooting what is and isn't working, free of charge. Not really. And I'm not just saying that. A lot of what I provide requires an objective perspective. It's really difficult to step back and detach emotionally from the work you've sweat, cried, and bled over. Also, what I do comes from years of training and experience as a quantitative (analyzing numbers)/qualitative (analyzing words) researcher and therapist (analyzing people). Not all social scientists have had that combination of training. But the secret sauce is my ability to use transform analyses into insight and action. The strategies I use aren't industry specific... they're goal specific. Meaning, we'll take a hard look at what goals you want to achieve in your business and create a strategy that will help you reach your goals. My process has worked for clients in a wide range of industries... from trucking experts to clothing designers, I know it will work for you too. Do your skills and capabilities match what I need? I have successfully done and/or consulted on everything mentioned here. I'm also a social scientist by training, which means that I conduct and apply research on human behavior and human relationships to every project I take on. Knowing how people think and behave in certain situations gives me an edge when it comes to business. A client once asked me where I got my business degree. She was surprised to hear that I don't have one. As a business owner and researcher, I've learned a ton about (online) business. But it's my training as a social scientist/researcher that gets people results. The direct result from a Strategy Mapping session is a Strategy Map summary that you'd get within a few business days. Seeing results from putting the Strategy Map into action depends on how much time, energy, and resources you have to implement the strategies. I'm also happy to discuss how you can get more hands-on help from me after our session. I'll give you timelines and costs for those additional services. But like any other service provider, I can't guarantee you'll make $40k in 30 days (for example). But I do have a Rewind Guarantee. Meaning, you're entitled to another meeting if you implement the strategies we discussed and found that they didn't work for you. The guarantee is valid for 90 days after our meeting. What if I need to reschedule or cancel a meeting? If you need to reschedule a booking, please let me know at least 24 hours before our meeting. Any later than that, and I add or deduct a fee equivalent to a single hour. please note that I don't process refunds for no-shows. But what if I'm not happy with my results? When you buy a service from me, I commit to being available to serve you. In fact, I usually start working for you as soon as I see you're interested. That affects how many other clients I can take on. For that reason, I don’t offer refunds for any strategy sessions. I also offer no guarantees regarding conversion rates or business growth. BUT I haven't had one meeting yet where a client hasn’t left with 1 brilliant idea worth at least 5 times the price of the meeting. If you want to make absolutely sure my style is right for you, I suggest starting with a Discovery Call.